“The Kid Who Would Be King” has some solid, fun-for-all-ages moments. It’s a modern wish-fulfillment fantasy crossed with Arthurian legend, and the blend delivers action as well as a positive message. However, the positives here do not outweigh the hindrances here. It’s too long, too derivative of sources other than its overt inspiration, and has performers in lead roles who just aren’t strong enough to carry the film. Younger audiences will enjoy it. But there’s not enough here for that enjoyment to transcend the target age group. “The Kid Who Would Be King” focuses on Alex (Louis Ashbourne Serkis), a regular London kid growing up with his single mother (Denise Gough, “Colette“). Alex and his best friend Bedders (Dean Chaumoo) are both new to their school, Dungate Academy, and as such are suddenly the little fish in a much bigger pond. Their regular tormentors are schoolyard bullies Lance and Kaye (Tom Taylor, Rhianna Dorris). Together, they make life miserable for anyone smaller than them, which is just about everyone at Dungate but especially Alex and Bedders. But one day while fleeing from Lance and Kaye Alex finds something extraordinary unearthed in a neighborhood construction site — a literal sword in the stone. More amazingly, he finds he’s able to draw the sword, and when he does, strange things start happening. It’s not long before the boys are approached by the wizard Merlin himself (Sir Patrick Stewart, “Logan“). Disguised as a teen (Angus Imrie), the wizard seeks out the sword and its new bearer bringing terrible tidings. Merlin reveals to the incredulous boys the reason why the sword returned to the world, as well as the danger it heralds. Morgana (Rebecca Ferguson, “Mission: Impossible – Fallout“), Arthur’s wicked half-sister imprisoned in the earth following her defeat by Camelot’s knights, is poised to return and plunge the world into darkness. Only Excalibur’s bearer can turn the tide, and only if its bearer and his followers live by the ancient code of chivalry that made Arthur’s knights the romantic heroes of legend. Turn antagonists into allies. Recruit a new round table of knights. Stop Morgana and the ancient darkness she promises to unleash. Don’t be late for supper. No problem, right? 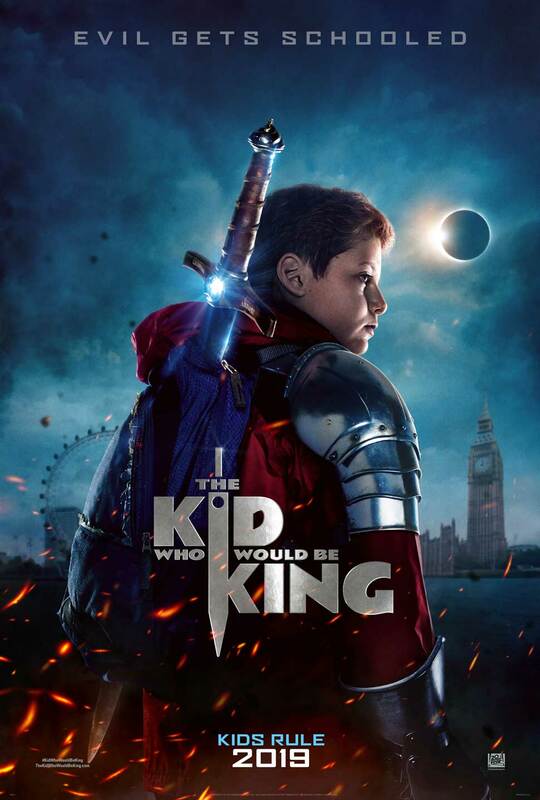 There is a clever and poignant idea driving “The Kid Who Would Be King”: that we live in a world without true leaders. The film’s script is not subtle at all in pointing out the divisiveness surrounding us thanks in part to the 24-news-cycle. As a result, everyone — even kids — wraps themselves in cynicism and resignation. The world is the way it is, and no one, especially not children, can change it. Such despair is the antithesis of modern interpretations of the Arthur legend. From “The Once and Future King” to “The Sword in the Stone,” the idea is that anyone, even someone from humble beginnings, can lead the fight for hope and change. “The Kid Who Would Be King” revives that theme and argues for its relevance in the 21st Century. The film defies any possible characterization of corniness, and that, if anything, is the film’s most endearing attribute. Its earnest argument for the strength and courage inherent in common decency aims at inspiring its younger audiences. It’s a laudable effort, one that unfortunately falls short in the execution. 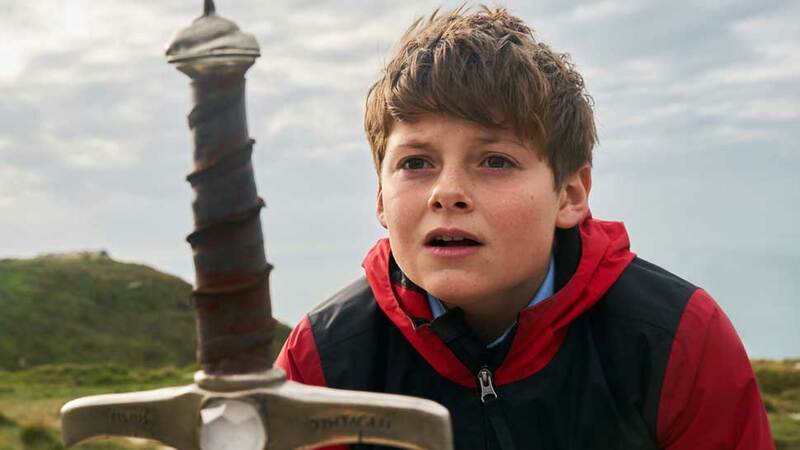 By design, “The Kid Who Would Be King” places its youngest stars in the forefront. Like the earliest “Harry Potter” films, its hindered by those performers’ inexperience. Youthful energy only goes so far — after a while, the effort to emote becomes painfully clear, especially with a two-hour-and-twelve-minute running time. Speaking of “Harry Potter,” this film also suffers from coming in the wake of that beloved series. We’ve seen this story before, and though “Kid” does reference “Harry Potter” in its script in an effort to downplay its derivative qualities, it’s tough to get past the cinematic deja vu. Now, is it fun to see Sir Patrick Stewart, who decades ago played one of Arthur’s knights in “Excalibur“, and Rebecca Ferguson chew scenery in their roles? Absolutely. The production also benefits from breathtaking location photography — without a doubt, it’s pretty to look at when it leaves the confines of the London schoolyard. But all that’s just not enough to lift “The Kid Who Would Be King” into kingly territory. Want to introduce your children to the Arthur legend? Start with “Sword in the Stone,” then maybe transition to this. Starring Louis Ashbourne Serkis, Tom Taylor, Dean Chaumoo, Rhianna Dorris, Angus Imrie, with Rebecca Ferguson and Patrick Stewart. Directed by Joe Cornish.